The Synthetic Biology Mashup is a weekly review of articles and news related to synthetic biology and metabolic engineering. While we share most of this on our twitter feed, if you need to catch up on this week’s news just read ahead! On July 2, 2015, a memorandum was released for the heads of the United States Food and Drug Administration (FDA), Environmental Protection Agency (EPA), and the Department of Agriculture (USDA) to modernize the Federal regulatory system for biotech products and to establish periodic updates of the system. The purpose of this memorandum is to keep public confidence in the system high, allowing for the best novel scientific breakthroughs to be brought into the economy by preventing barriers to future innovation and development, improving coordination, transparency and efficiency throughout the industry, all while protecting human and animal health and the environment through risk assessment and regulation. The memorandum also sought to divide the responsibility of regulation across the three government agencies. The principals outlined in this memorandum have now been applied to the regulatory framework for the biotechnology industry, including Synthetic Biology. Stevens, et al. published an article on July 7, 2015 comparing future data storage of genomes to Big Data domains such as astronomy, Twitter, and Youtube. Genome sequencing is becoming more popular and less expensive and has implications in scientific discovery and personalized medicine. Currently the Sequence Read Archive (SRA) maintained by the United States National Institutes of Health (NIH) holds raw sequenced data of 32,000 microbial genomes, 5,000 plant genomes, and 250,000 individual human genomes. Although it seems to be a very high estimate, the authors of this article believe, 100 million to as many as 2 billion individual human genomes and 1.2 million plant and animal genomes for energy, environmental and agricultural purposes will be sequenced by the year 2025. The actual number of genomes sequenced will depend on a number of factors including decreasing the price of sequencing a genome (currently about $1,000 per genome), whether the computational technology to store the all of the data will be developed, willingness of the public to sequence their genomes, and government regulations preventing the sequencing of genomes outside of medical purposes. Additionally, it will be important to develop an adequate secure storage system, to prevent confidential medical information being released to the public. 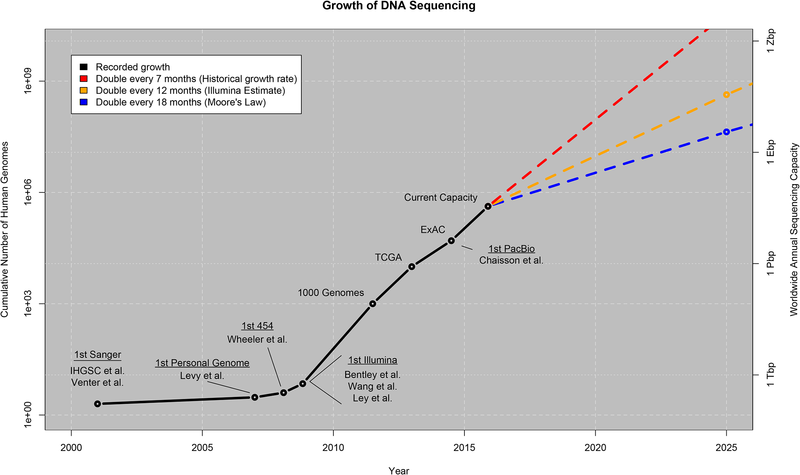 Figure 1: Projected growth of genomic sequencing technology. Source: Stephens, ZD., et al., Big Data: Astronomical or Genomical? PLoS Biology, 2015. In a paper published in Cell on July 9, 2015, researchers at MIT modified basic computing elements in the bacterium Bacteroides thetaiotaomicron, a prevalent and abundant commensal bacterium of the human gut. These sensors, memory switches, and circuits are able to respond to signals in the gut and could potentially be used for for surveillance of or therapeutic delivery to the gut microbiome. Prior to this achivement, genetic circuits were only built inside of model organisms such as E. coli that is present only in low concentrations in the gut. Once an environmental stimulus, such as a food additive, has been detected by this genetically modified bacterium, genes can be turned on or off for controlled treatment of inflammation or cancerous tissue. The bacterium is also engineered to remember the environment by transcribing recombinases, which record information into bacterial DNA by recognizing specific DNA sequences and inverting their direction. Creating genetic circuits in commensal bacteria will potentially allow for non-invasive monitoring of the gut, long-term targeted therapeutics, and further functional studies of the digestive tract. If you would like to learn more, please read the published paper! DEINOVE, a French biotech company that uses Deinococcus radiodurans bacteria for the production of biofuels and bio-based chemicals recently partnered with Canada’s POS Bio-Sciences for the development, extraction and purification of carotenoids. POS Bio-Sciences is a leader in the extraction of high value compounds, such as carotenoids. D. radiodurans is an extremophile bacterium that can withstand large amounts of ionizing radiation, cold, dehydration, vacuum and acid. In recent years, DEINOVE’s DIENOCHEM division has been working to create a strain of D. radiodurans to increase its natural propensity to produce carotenoids. Humans and animals do not produce carotenoids de novo and carotenoids must be consumed from diet. Carotenoids prevent cancer, heart disease, inflammation, and vitamin A deficiency and promote eye health. They are also used in food coloring. The global market for carotenoids is expected to be $1.4 billion by 2019, with an estimated annual growth rate of 3.5%. To learn more, please read DEINOV’s press release! Led by the European venture capital firm, Seventure, Eligo Bioscience, a French startup hoping to revolutionize the antibiotics market, received a €2 million ($2,237,000) in Series A funding. Eligo Biosciences is a spin-off company from MIT and Rockefeller University. Their “Eligobiotics” technology harvests CRISPR-Cas nucleases to produce sequence-specific antimicrobials able to selectively target harmful bacteria, while leaving good bacteria unaffected. In addition to targeted therapy, the “antibiotic” induces environmental pressure and competition between the good and bad bacteria to stop the infection. Eligo Bioscience technology has potential applications to treat infections in the skin, mouth, gut and vaginal microbiomes. Clara Foods, a spin-off of the artificial meat production company New Harvest, recently closed a deal worth $1.7 million in seed funding for their project to generate egg whites from genetically modified yeast instead of chickens. If Clara Foods can scale up production, their product could significantly decrease the cost producing egg whites. They could feasibly market to companies that use a large amount of egg whites in their production, such as pasta and condiment companies. Clara Foods uses similar synthetic biology technology to Hampton Creek, a plant based food producer, and Muufri, an animal free milk producer. In addition to decreasing the cost of egg whites, their product decreases the environmental impact of raising chickens and avoids the transmission of egg-borne diseases, such as salmonella and the avian-flu, while maintaining the same nutritional value as traditional eggs. Clara Foods is working with IndieBio to expand their business and connect with customers and investors. The company is currently trying to generate cooperate partners, which means that lab-grown eggs may be in the foods you eat sooner than you think! Twist Biosciences, a company pioneering breakthrough DNA synthesis technologies announced on June 9, 2015 that they closed a deal led by Illumina, Inc. for $37 million in Series C funding. To this date, Twist Biosciences has raised $82.1 million in funding. The funding will be used for a beta commercial launch their silicon-based DNA synthesis platform. Because silicon is a better conductor of heat , Twist Biosciences ~10,000 well silicon technology accelerates DNA synthesis reactions by ~100x compared to traditional plastic 96-well plates. They will be able to create oligionucleotides, genes, pathways and genomes at a faster rate and a cheaper cost. This can have major implications in synthetic biology industries such as personalized medicine and in vivo diagnostics, sustainable chemical production, agriculture, biodetection and data. On Wednesday July 15, 2015 Genspace [D1] NYC in Brooklyn, New York, is hosting a special event. Synthetic Biologist and professor Dr. Natalie Kuldell and designer Karen Ingram will discuss their collaboration on their new book “BioBuilder: Synthetic Biology in the Lab”. [D2] In addition Professor Paul Freedman from the Imperial College of London will discuss the latest developments in the Synthetic Biology field. Doors open at 6:30pm for wine and cheese and the talks begin at 7pm. If you are interested in attending, RSVP here! On July 20th, 2015, Sean Stevens, mammalian synthetic biologists who works on synthetic genomes, will be giving a lunch seminar on genome engineering for xenotransplantation. Xenotransplantation is the transplantation of organs, tissues and cells between species. Once the immunological barriers have been overcome, this technology can potentially be used to transplant organs from pigs to humans. If you are interested in learning more, come to the seminar at South San Francisco Conference Center, 255 S Airport Blvd, South San Francisco, CA 94080 from 11:30am to 1:30pm. Register for free here!